Each year, the Georgia Library Association presents members of the Georgia General Assembly with a beautiful print created by artist Debi Davis. If you’ve been to visit your state legislator, you may have seen their collection on the walls of their office. 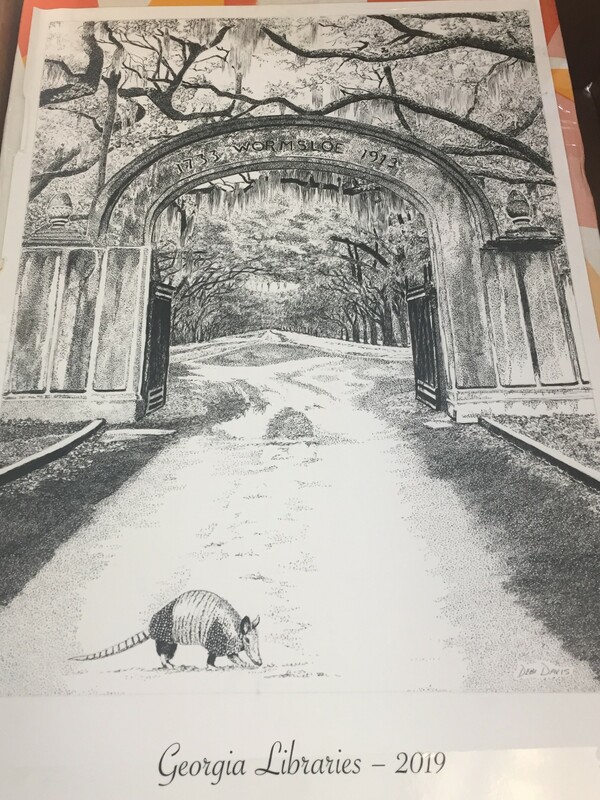 This year’s print features the oak-lined entrance of Wormsloe, and an armadillo. We need your help delivering these on Thursday, February 28th. The prints will be delivered to the office of each representative and senator, as well as the state’s Constitutional Officers (Secretary of State, Secretary of the Senate, the Governor’s Office, etc.). The more volunteers we have, the faster it goes! • We’ll meet inside the Capitol at 10 am for a photo op and to split into teams. • Groups will take prints to each office in the Capitol and the Coverdell office building across the street. • This is another chance to make connections and ask for support during legislative season. Getting into the Capitol is a bit like going thru airport security: leave your pocket knives at home and bring a picture ID. Parking is limited, and not free. The nearest MARTA stop is a short walk away and highly encouraged. Huge thanks to both the Georgia Council of Public Libraries and Baker & Taylor for helping make this happen!